It's Tea Time~This week I wanted to share my Nifty Thrifty Tea set. While visiting my mother a couple of years ago, sweetheart and I went to a city wide yard sale. We had a great time. A lady was selling these beautiful dishes for a song. She suggested I use the dinner plate to serve a pound cake. She was from Europe and she said " that's what they do with a dinner plate." I have the perfect pound cake to serve on my beautiful plate. The lemon loaf goes well with the pattern on the plate. And the lavender buds are so delightfully tasting. Some cream cheese and pomegranate jelly tastes wonderful on the lemon loaf. And the lavender is wrapped with a pink polka dot ribbon. Now for the nifty thrifty part. 11 piece set for $12.00 dollars. I LOVE A BARGAIN! I always want to throw a little love into my tea time. 'First Love' 1847 Rogers Bros. is my wedding silver pattern. What a beautiful presentation. The tarnished detail is so appealing to me. Some sugar for our tea? The slice of Lemon Loaf is ready for a bit of cream cheese and jelly. Two cups are ready. Would you like to join me for a spot of tea? A joyful collage to make my tea complete. Thank you so much for joining me at My Cozy Corner. I will be joining some wonderful friends for tea. Please come along and we will have a great time. Thank you so much for visiting me and please come back soon. Lovely tea set and the lemon loaf looks yummy. I love the scent of lavender. Beautiful photos, have a great week! beautiful tea set. I must make this cake - it sounds delicious! thank you for sharing. What a wonderful display and recipe! Lovely tea cups and dishes! I'll say you got a bargain. The tea looks so beautiful and the cake...yum. You had my attention when you said LEMON loaf! :D :D You got a wonderful bargain ... the Haviland is gorgeous. What is it about stacked teacups??!! So pretty! Happy Tea Day! What a delightful post! I love a lemon loaf and yours looks wonderful sprinkled with lavender. I knew your cups were Haviland. They are beautiful and what a bargain! Love your silverware too. Thank you for a lovely tea and enjoy your day. I'm so glad that I found you on Make it Pretty Monday! What a gorgeous spread and the Lemon Loaf looks delicious. Great job and excellent pics! Lovely Betty! A pretty set of dishes indeed. I love the pretty pastel flowers. We are in a lavender growing area, so you find lavender in everything around here. My favs are chocolate lavender ice cream, lavender creme brulee and lavender lemon pound cake! Just like yours! Thanks for sharing your wonderful tea and linking to Tuesday Cuppa Tea! I love your tea set...it's so delicate and pretty. I like the soft pastel colours. Lavender on the cake ..I would never have thought of doing that. What a beautiful table setting. Your lemon loaf looks delicious. Thanks for sharing. Thanks for linking to Heart & Home. I think you got a wonderful bargain with that pretty china setting! I love the delicate pattern and the lemon cake looks very good on the dinner plate. We often use dinner plates like this in Australia too. Oh my! That was a very well spent 12 bucks! Haviland for that??? You are a lucky girl! The pattern is gorgeous and your tea setting looks amazing with them. I do like the woman's cake plate idea! It works! Your pound cake does look amazing, I would love a bite! Yum! Yummy!! Wow this' looks so delicious and your tea set is gorgeous! The china is beautiful! Definitely a steal at that price. Betty, your images are stunning! The lemon and lavender loaf looks great and I like how you placed the lavender that is wrapped in tissue on your table. Pretty! The dishes are lovely!! That lemon loaf looks yummy!!! Visiting from Trish's Heart and Home. This whole is unique and wonderful. The pound cake looks beyond delicious, and I love the pattern of the dishes. 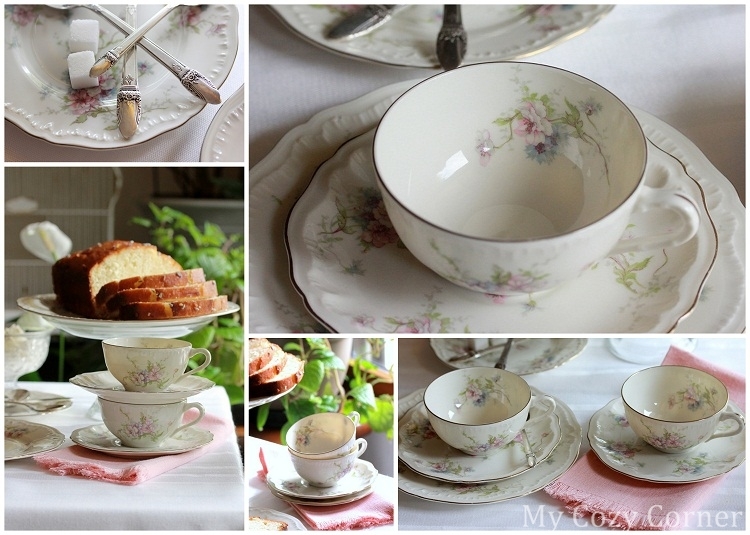 How truly lovely- what a gorgeous tea setting - and such a wonderful price! Everything looks so beautiful and deliciious, thank you so much! Your lemon loaf looks tasty! Your comment is always a delight to read, leave me one when you can. What a lovely tea party. Love the teacups and that lemon cake makes my mouth water! Love your tea setting. Such a lovely place to share time with friends. Happy first day of fall to you! Amazing tea set and what a wonderful price! I would love to find such a ... Find! Yummy, would love to bake a lemon loaf too.. Visiting from PS- hope you can stop by..